Pen and ink drawing of a sculpture of Varahi from Jajpur in Orissa, by an anonymous artist, taken from an album of 37 drawings (43 folios) of sculpture at Jajpur, Puri, Bezwada and Sitanagar made during a journey from Bengal through Orissa to the Coromandel Coast, part of the MacKenzie Collection, dated 1815. Colin MacKenzie (1754-1821) joined the East India Company as an engineer at the age of 28 and spent the majority of his career in India. He used the salary he earned from his military career as a Captain, Major and finally a Colonel to finance his research into the history and religion of Indian and Javan culture, collecting many sketches and drawings along the way. Jajpur is a sacred pilgrimage site in Orissa that is situated on the Vaitarani River. There are numerous temples at the site, the most important being the shrine of the mother Goddess Viraja (Durga), and the shrine to Varaha, the incarnation of Lord Vishnu as a boar. 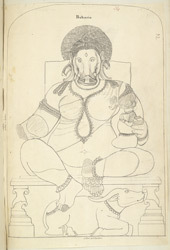 This drawing depicts the colossal four-armed image of Varahi seated on a pedestal, her foot resting on a buffalo. The sculpture is described in the 'List of the Ancient Monuments of Bihar and Orissa' of 1931: "The image represents the earth Goddess, who assumed human form in order to become the wife of the boar incarnation of Vishnu. She is shown with three eyes, and the hair is treated in 'cork-screw' curls raised high on the forehead. She wears ornaments and a sari...Three of her four arms are broken; the fourth holds a child on her left thigh. The head of the child was formed of a separate block of stone and has disappeared. The image, which is carved in chlorite, is practically in full relief..."